For the defunct baseball venue in Washington, D.C., see American League Park. Hilltop Park was the nickname of a baseball park that stood in the Washington Heights neighborhood of New York City. It was the home of the New York Yankees Major League Baseball club from 1903 to 1912, when they were known as the "Highlanders". It was also the temporary home of the New York Giants during a two-month period in 1911 while the Polo Grounds was being rebuilt after a fire. The ballpark's formal name (as painted on its exterior walls) was American League Park. 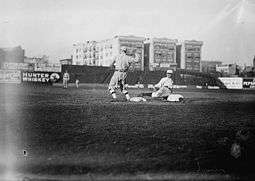 Because the park was located on top of a ridge of Manhattan Island, it came to be known as Hilltop Park, and its team was most often called the New York Highlanders (as well as the Americans and the Yankees). This "Highland" connection contrasted with their intra-city rivals, the Giants, whose Polo Grounds was just a few blocks away, in the bottomland under Coogan's Bluff. The field was initially huge by modern standards — 365 ft (111 m) to left field, 542 ft (165 m) to center field and 400 ft (120 m) to right field. An inner fence was soon constructed to create more realistic action. Both the park and the nickname "Highlanders" were abandoned when the American Leaguers left, at the beginning of the 1913 season, to rent the Polo Grounds from the Giants. The Polo Grounds had a far larger seating capacity, and by that time was made of concrete due to the 1911 fire. Hilltop Park was demolished in 1914. 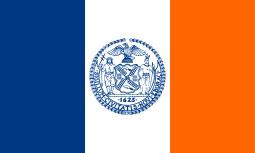 American League baseball came to New York City in 1903 when gambler Frank J. Farrell and former New York City Police Chief William S. Devery, bought the Baltimore Orioles franchise for $18,000. 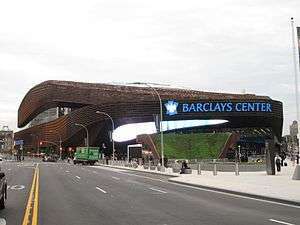 They established the team at Hilltop Park, a hastily constructed wooden park seating about 16,000 fans, on the west side of Broadway between 165th and 168th streets. 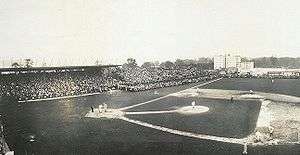 Opening Day came on April 30, 1903, when the New York Highlanders played the Washington Senators. The ballpark site was quite large for its time (9.6 acres or nearly double the size of many ballpark sites of that era), and the south portion of the land plot was used for the parking of first carriages and later automobiles. The shape of the land plot was a large trapezoid with right angles at the site's northeast and southeast corners. The left field foul line ran mostly North to South and was parallel to Fort Washington Road (the western boundary of the park). The left field foul line would, if extended about 20 additional feet, have intersected 168th Street at less than 90°. The right field foul line would, if extended, have intersected Broadway (the eastern boundary of the park) at more than 90°. The ballpark site was thus trapezoidal in shape and large for the Deadball Era. The seating capacity of 16,000 was also rather large for this time period. Capacity in the dead-ball Era was a flexible concept. In accordance with the practices of the day, overflow crowds were allowed to stand in the perimeter of the outfield. In addition, for "big" games, additional standees were allowed down the foul lines and between home plate and the backstop. Thus the effective overall capacity of the park was closer to 25,000, although even when stuffed to the gills, it fell well short of the normal capacity of the Polo Grounds. The original 1903 construction of Hilltop Park cost about $200,000, more than two-thirds of which was spent for rock blasting and excavations; and the groundskeeper of the Highlanders, Phil Schenck, laid out the playing field. The ballpark consisted of a covered grandstand of three sections, although it was not actually roofed until June 1 that season. Two sections of the grandstand were parallel to the foul lines and the third section was a short intermediate diagonal, which formed the backstop. The grandstand extended a short way past both first and third bases, and a clubhouse was located behind the center field fence. Single-deck bleachers that extended down both foul lines reached from the grandstand almost to the fences. The third base bleachers were not finished until June 1903. These first and third base bleachers angled towards the foul lines reducing the foul area at the fences to about 15 feet. A modest-sized scoreboard was in fair territory down the left field foul line. The main entrance to the park was on Broadway and a ramp led up to the top of the first base grandstand. Unlike many of the other contemporary wooden ballparks-this one never burned. Hilltop Park was not in good condition when it opened. There was a swamp in right field that had yet to be filled with rock, the outfield had no grass, the grandstand had not been completed, and players had to dress at their hotel rooms because the clubhouse was not completed. When Hilltop Park was finally completed, a single tier wooden covered grandstand extended from the third base dugout to homeplate, and around to the first base dugout. Uncovered grandstands extended to both foul poles. 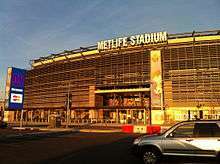 From behind homeplate, fans could see scenic views of the Hudson River and New Jersey Palisades. A bleacher section was placed in the center field corner around 1910, painted black to serve as a batter's eye screen. 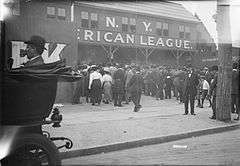 After the Polo Grounds burnt down in 1911, the Highlanders/Yankees offered to share their facility with the New York Giants, and the grateful National Leaguers took up temporary residence in Hilltop Park. After two more seasons, the American Leaguers moved a few blocks east and south into the rebuilt Polo Grounds to sub-lease from the Giants, and the nickname Highlanders was dropped as the team was now strictly "the Yankees". 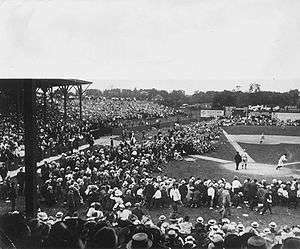 The last big league game played at Hilltop Park was on October 5, 1912. The park was demolished in 1914. Hilltop Park in 1912. The three buildings above the bleachers still stand today on 168th Street and Broadway. Two Hall of Fame pitchers had good outings at Hilltop Park in 1908. One of the more impressive pitching performances of all time took place at the Hilltop. On September 4, 1908, 20-year-old Walter Johnson of the Washington Senators/Nationals shut out the Highlanders 3-0 with a five-hitter. The next day, Johnson again blanked the Yankees, 6-0, on a three-hitter. 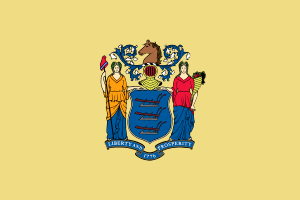 The city's "blue law" prevented a game on Sunday. On Monday, September 7, Senators manager Joe Cantillon again gave Johnson the ball and he improved again, this time hurling a two-hit, 4-0 victory over the Hilltoppers, his third shutout in the space of four days. 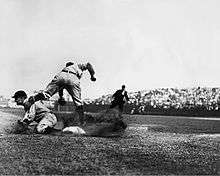 In a game "sometime in 1909" according to photographer Charles M. Conlon (some sources claim an alternate date, July 23, 1910), Conlon snapped a photo of Cobb sliding into third base, stealing the base and spilling Highlanders' third baseman Jimmy Austin. This photo became one of the most famous and widely circulated baseball photos ever. On May 15, 1912, after being heckled for several innings, Cobb leaped the fence and attacked his tormentor. He was suspended indefinitely by league president Ban Johnson, but his suspension was eventually reduced to 10 days and $50. The Tigers went on a one-game strike for the next game, at Philadelphia, but rather than forfeit, the Tigers owners filled the lineup with a makeshift group of ex-college players and whoever else could be found. Coincidentally, one of the substitutes, Billy Maharg, would become involved behind-the-scenes in the Black Sox Scandal seven years later. The site where Hilltop Park once stood remained vacant until the land was purchased by Edward S. Harkness for the express purpose of building the world's first academic medical center. Columbia-Presbyterian Medical Center opened in 1928 and is now called NewYork-Presbyterian / Columbia University Irving Medical Center. On September 30, 1993 a plaque was placed on the hospital grounds to mark the former location of home plate in Hilltop Park. The plaque was donated to the hospital by the New York Yankees to commemorate the exact location of where home plate rested in Hilltop Park. The plaque is bronze and is the same size and shape as home plate. The text on the plaque reads, "Dedicated to Columbia-Presbyterian Medical Center and the community of Washington Heights by the New York Yankees to mark the exact location of home plate in Hilltop Park, home of the New York Highlanders, from 1903 to 1912, later renamed the New York Yankees." ↑ "Baseball's Big Crowd". New York Times. May 1, 1903. p. 7. Retrieved October 23, 2009. ↑ "Highland Park", The New York Times, April 6, 1903, p. 6. ↑ Joe Vila. "The old ballpark", The New York Sun, March 6, 1923, p. 20. ↑ "When the Yankees Were on the Top (of the Hill)". Retrieved 2013-12-25. Wikimedia Commons has media related to Hilltop Park.